The Grand Parade was held on the last day of the Honolulu Festival on Sunday, March 15, where over 100 performing groups paraded on the streets of Kalakaua Avenue in Waikiki. The participating groups gathered at Fort DeRussy Beach Park before the parade. They were preparing and practicing for the last time as they waited for their turn. Also, there were a lot of children among some of the participating groups, where they took pictures with their parents and interacted with other groups. There were a lot of spectators on the roadside than last year, which they waited with great anticipation. Furthermore, there was a sudden rain which has stopped quickly. 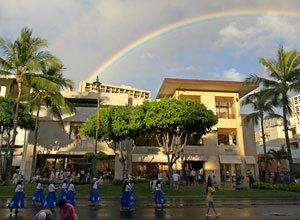 Then, the rainbow appeared in the sky, as if it was celebrating the beginning of the Grand Parade. The parade finally began with a police barricade which led the parading routes. 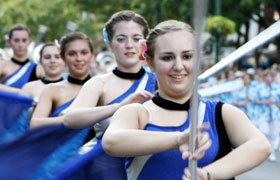 The first appearance was the Royal Hawaiian Band which played the beautiful march. Next were the attractive winners of the beauty pageant such as Miss Hawaii Filipina and Miss Korea. Then the traditional hula dance was performed. Also, there was a baton twirling performance by the cute little baton twirlers. 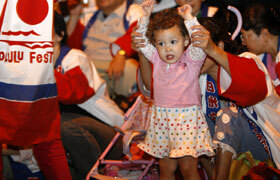 It was followed by the energetic cheerleaders and cheerful high school team. Next was the dancing performance by the wild and strong Australian aborigine. 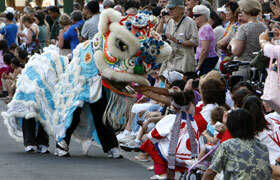 In addition, the prosperous Chinese dragon dance was performed. Then, there was a performance of the upbeat hip-hop dance. 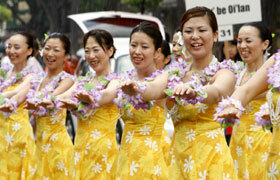 Furthermore, there were various performances from various countries of the Asia-Pacific region. The roadside was crowded with spectators, where there were continuous applause and cheers. Also, many of the performing groups were from Japan. One of the annual participating groups Sugaizanairen has a lot of local fans. 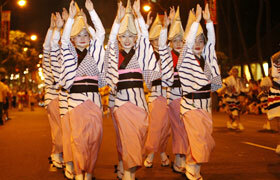 Then, the Team Hosei consists of college students in which they performed the yosakoi dance. Also, Kokura Giondaiko Hozonshinkokai showed a wonderful performance of the taiko drumming. In addition, the Nippon Sport Science University Cheerleading Club VORTEX participated for the first time this year which showed such a dynamic acrobatic moves. 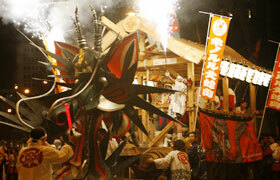 Furthermore, the Daidengaku participated for the first time. The Japanese actress Keiko Matsuzaka came to show her support which they both co-starred in the play Tenshu Monogatari. The last appearance was the Honolulu Daijayama. 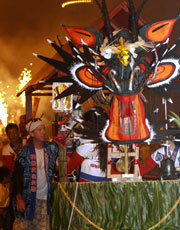 The Daija’s gigantic cart weighs over 2 ton which appeared with a spark of flame and ringing sound of bells. The spectators cheered as it appeared which the parade reached its climax. 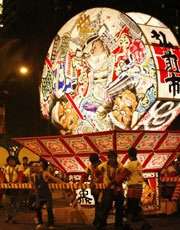 The parade came to an end when the flame of the Daijayama had disappeared. The Chinese lion dance was performed by the children this year, which was very popular among the spectators along the roadside. The spectators are waiting for the parade with anticipation. 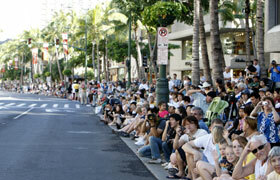 Kalakaua Avenue was packed. 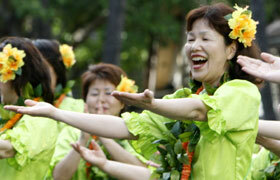 The members of Yutaka Hula Halau danced with lots of smiles. Dancing the hula dance in Hawaii must be something special. Miss Cherry Blossom were waving their hands from a convertible. Their beautiful smiles captivated the spectators. The members of Miyagi University Kosuzume performed the Suzume dance by using the front and back of a Japanese fan in a skillful manner. Their colorful costume and Japanese fan were beautiful. The members of the Hempfield Spartan Marching Band from Pennsylvania marched with the color guard and brass band. The high school students from Sonoda Gakuen performed their effortful dance to the crowd. Their sky blue T-shirts covered the Kalakaua Avenue. The members of Obama Girls & Obama Boys were wearing a vivid yellow colored costume. You can feel their enjoyment by watching their performance. 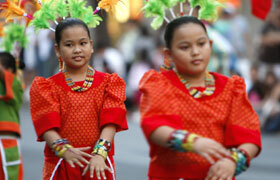 The children of Montessori De Cagayan Dance Troupe from the Philippines were very popular even in a big parade. 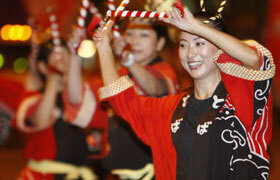 The members of Toba-City Tourist Association danced with the local volunteers. 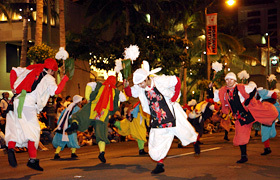 They decided to participate since they enjoyed the previous years at the Grand Parade. The Nippon Sport Science University Cheerleading Club VORTEX is one of the best cheerleading group in Japan. Their acrobatic lifting performance went up to 3-level which excited the spectators. The members of the Daidengaku showed such a memorable performance which became an unforgettable memory even for the volunteers. Also, Keiko Matsuzaka came to show her support as well. 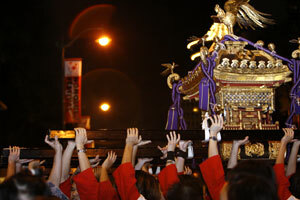 The high school students from Maui designed the mikoshi which incorporated the sub-theme of this year’s Honolulu Festival. 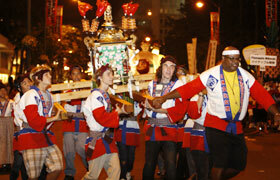 They carried their own mikoshi during the parade. 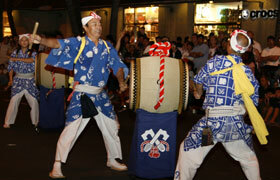 The powerful taiko drumming of Kokura Giondaiko Hozonshinkokai was performed. The members of Tonosama Ren performed Awa-Odori which was beautifully formed. The sound of their music makes you want to dance. She was eager to dance while she was watching the performance by Tonosama Ren. She might be joining the group when she grew up. Mr. Yoshizawa, who folded the Daijayama out of origami was popular among the volunteers. It seems like the beauty of Japanese origami was reached to Hawaii. The flaming Daijayama appeared at last. Its powerful appearance excited the spectators. This performer took pictures with the spectators during the parade. The spirited performance goes beyond the border. The pictures of warriors were drawn on the cart of Hirosaki Neputa for the 15th Annual Honolulu Festival. They were especially shining during the evening. The Chibbiko Daijayama participated for the first time this year. 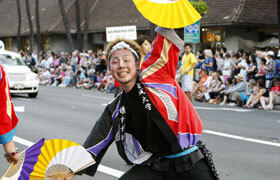 It paraded on the streets of Kalakaua Avenue under the watch of the Honolulu Daijayama.